I bought a couple of new cycling jerseys recently, and now that I have had a few weeks wear out of them I thought I would give a mini review. 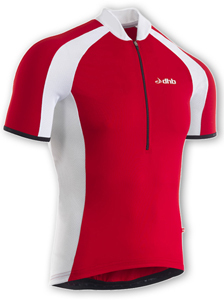 First up we have the Wiggle brand, DHB Clip Short Sleeved Cycling Jersey! This is a nice jersey, the nylon/elastane fabric gives it a much lighter and smoother feel than my other jerseys that are mainly 100% polyester. I like the design, especially the collar, and as a garment this is extremely light in weight. The side mesh panels are very breathable, and with a good length of front zip it has proved comfortable to wear during the recent “changing” weather – days where it has been in the mid to upper 20’s and days where it has been struggling to reach 14C and drizzled non stop! It is indeed ‘form fitting’ (read close fitting), and my choice of Medium fits me just fine (for reference I am 5ft 8, 30 inch waist and 38 inch chest.) It certainly wont be flapping around in the wind! The grip tape works well to keep the jersey from riding up, and the middle zip pocket, along with the other two open pockets, are useful for “coffee stop” cash and other such cycling essentials. All in all I think it is well worth the asking price and yet another piece of DHB cycling kit that I have been more than happy with. I think I could be quite tempted with the black one too!